All in all, I think that Facebook is a wonderful form of communication. I love being able to communicate with friends in a quick , nearly universal medium. i love being able to catch up with long-lost friends whom I haven’t seen or spoken to in years. I love the links, the memes, the photos and yes, the Bitstrips. For a little while, I to was addicted to my favorite Facebook games: Mafia Wars, Citville and eventually MLB Ballpark Empire. I even love the story of Facebook’s creation, as depicted in the book The Accidental Billionaires and the movie The Social Network. I am always baffled how Facebook was somehow able to be both cool for the college kids AND their parents; yet completely avoided any “uncool” phase. Of course, I am a human being and I’ve felt the sting of Facebook in all it’s various forms. Like many, I too, am often fooled by the illusion that Facebook is socializing itself, rather than a means of socialization. As a teacher, I can attest that probably 50% of all the fights that start in any high school in America probably stem from something that one student said about another. In my time on Facebook, I’ve pissed off my immediate family members with random posts expression my general feelings or mood at a moment. I’ve almost certainly offended “Facebook friends” with my political posts, my language and my attitudes towards things in popular culture. Like many other Facebook users, I’ve gotten into my fair share of arguments with people whom I have never met, never spoke to, never even been Facebook friends with. Facebook is a place where people can say and do things without fear of consequence. Because of it’s almost lightning-like infiltration into our culture, people confuse it – a tool for socialization – with the act of socialization itself. People use it as a soapbox to have their voices heard by as many people as possible. People use it as a source of affirmation. We value the events of our daily life by how many ‘likes” our status updates get. Furthermore, we use it as a means to brag. “Hey world, look what I did today”. Hell, I’m guilty of all of these things myself. Facebook is a wonderful tool. It has made probably made communication easier than it has even been before. But like all good things in life, many Facebook users have taken things too far. Sometimes we rely too heavily on it. The reality is that my actions, interactions and indiscretions in social media, this very blog and the internet in general have probably done more to undermine my relationships and friendships that most of my face-to-face interactions. There’s an old saying that “ignorance is bliss”. Although I hate being left in the dark on things, sometimes I think this expression is absolutely true. Sometimes – not always but sometimes too much information – or worse, not enough information that we perceive to be too much information – can be a bad thing. 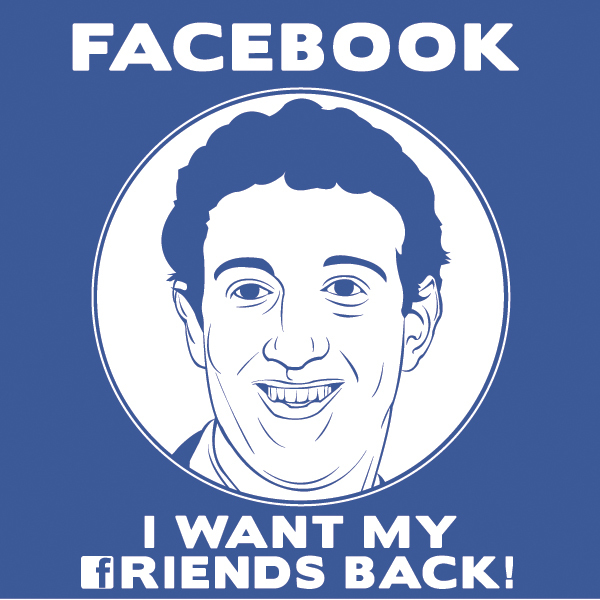 I’m certainly guilty of perceiving Facebook to be The Gospel of the Digital Age. If it’s on Facebook, it must be the truth, the whole truth and nothing but the truth. This line of thought brings me to Jabba – and my inevitable decision to de-friend her. It was admittedly one of the best decisions I have made throughout my divorce process. I don’t need to hear about her crap. Status updates are just digital PR and spin. It’s what the user wants us to hear and it is never the end-all, be-all truth. On the other side of the same coin, Facebook relationships are not relationships are not real relationships – however much they may appear to be; nor is Facebook flirting real flirting. When these things move from Facebook to real-life, that is another story entirely. This brings me to The Auteur. I have blown Facebook postings out of proportion with her in the past. These are the kinds of things that, had I never been on Facebook, I would have never seen; never would have heard and would never have phased me. Sadly, these incidents and the way in which I chose to handle them plague my relationship with her to this day. Unfortunately, I cannot change the past, but I can make changes to prevent the same mistakes from happening again. If the Facebook platform is a common denominator in all of these scenarios – my mom, Jabba, The Auteur, then it’s time take a step back. I am going to be taking something of a hiatus from Facebook. Although I’ve pissed off a lot of strangers on it, I feel much worse about the family friends and loved one I have hurt and angered through my actions there. I’ve become too dependent on it and I have blown out of proportion too many things I have seen there. I am not going cold turkey and I won’t be giving it up forever. I will continue to blog. In fact, I hope to focus more on blogging. Since going public, my blog has been viewed by people in 7 countries and I’m already to the point where I have to continue writing if I want more views. I want to expand on that. But most of all, I want to re-focus on people. Not the things they chose to post, or fragments of conversations; but real people and the things say and do in the real word.